Built: The Simmtronics XPAD Turbo tablet is about 8.5 mm thick and it weighs nearly 273 grams. Display: This tablet features a capacitive multi touch display of 7 inches that provide a resolution of 1024 x 600 pixels. Processor: The Simmtronics XPAD Turbo has been equipped with a dual core processor clocked at 1.2 Giga Hertz and a Mali 400 MP GPU. Software: This device functions on android 4.2.2 Jelly Bean platform. Memory: This tablet features a RAM of 512 MB and internal storage space of 4 GB. It also provides up to 32 GB expandable memory with the help of a micro SD card. Camera: The Simmtronics XPAD Turbo tablet comes with a primary camera of 2 mega pixels and a front facing VGA camera of 0.3 mega pixels for making video calls. Connectivity Features: The connectivity features included in this tablet include A-GPS, Wi-Fi, Bluetooth with A2DP and 3G. 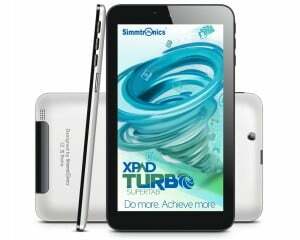 Other Features: The Simmtronics XPAD Turbo is a dual SIM tablet with dual standby feature. It comes with a built in speaker, FM Radio and a 3.5 mm audio jack. Battery: This tablet works on a battery of 2800 mAh capacity that is sufficient to deliver a standby time of 140 hours, video playback time of 3 hours and web browsing time of 4 hours. Our Take: The Simmtronics XPAD Turbo tablet comes with some decent features and stands a good chance in the market. This device will be available for sale in all the leading retail outlets, selling Simmtronics products, across the country.